She can sing and she can dance. Now she can be found on the front of a t-shirt near you. It’s Jennifer Lopez at her finest. Jennifer Lopez is the perfect center piece for this t-shirt. It is a picture from her midriff to the top of her head. She is looking over her left shoulder and her hair is blowing in the breeze. Isn’t she beautiful? This Jennifer Lopez t-shirt comes in sizes ranging from Small to 3XL and is made of 100% cotton. It is a unisex fit, so everyone can enjoy this amazing t-shirt. It will go with your favorite blue jeans quite nicely. The Gold Rush was Charlie Chaplin’s movie. He wrote, directed and produced this 1925 classic. Now you can capture a piece of that movie in this wonderful t-shirt. The graphic has become the t-shirt because it is all over it. The same image on the front can be found on the back of the t-shirt as well. Charlie Chaplin is sitting at a table and he is eating an amazing feast. But wait! Is that his boot? 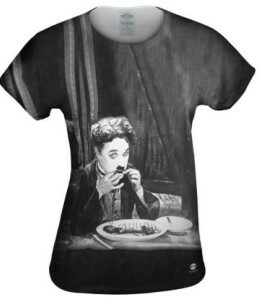 This Charlie Chaplin t-shirt comes in women’s sizes ranging from XSmall all the way to a 4XL. It is super comfortable and soft enough to even wear as a pajama top. It is made from polyester and spandex for a loose fitting and amazing t-shirt. Don’t worry, it will go with everything in your closet. 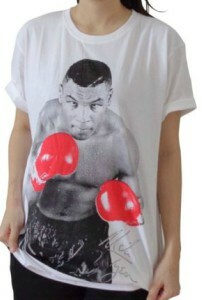 Whether you are a boxing fan or not, you will know who Mike Tyson is and you will want this great t-shirt. It will suit anything in your closet, even your red shoes. The graphic on this t-shirt is an oversize one. It is a black and white image of Mike Tyson staring you down in the ring, ready to pounce. The highlight of the graphic is his big, red boxing gloves. There is also a Mike Tyson signature printed on the t-shirt in the bottom right of the graphic. This women’s t-shirt comes in Small, Medium and Large. It is made from 100% cotton, so you know it will be super comfortable, high quality and durable when you are wearing it around town. People won’t mess with you! 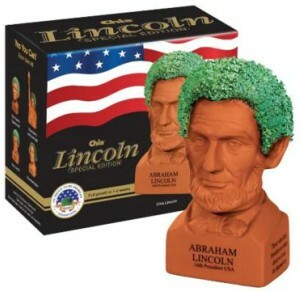 Celebrate the life of the 16th President of the United States Of America with this amazing special edition Chia pet. Abraham Lincoln was President from 1834 until 1842 and still to this day is ranked in the top 10 Presidents through out time. Now he can be yours to give you some “Presidential” treatment where ever you might need it. This Chia pet is designed like a bust of Abraham Lincoln. The base that his head is on reads two different famous quotes on either side. One is, “Those who deny freedom to others deserve it not for themselves.” The other is, “Leave nothing for tomorrow which can be done for today.” Two great quotes. The growing part of the Chia is his hair. Full growth of the Abraham Lincoln Chia is 1 -2 weeks and it comes with enough seeds for 3 cycles of growth. He measures approximately 6 inches by 5 inches by 4 inches. It will be the best indoor plant you have. If you are in love with classic rock and roll and the icons that represent it, then Frank Vincent Zappa, the American musician and songwriter will make your wardrobe sing. This t-shirt features a picture of Frank Zappa circa the 1970’s. It is set in black and white. He has his large, full moustache that he is known for. Above his face in red, block letters is “ZAPPA”. Classic to say the least. It comes in a coal color to compliment the red letters and Frank’s face. 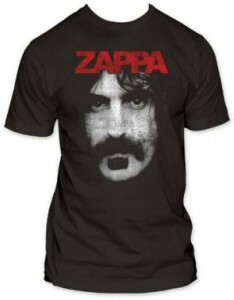 This t-shirt is made of 100% cotton and comes in men’s sizes Small to 3XL for all the Zappa true lovers out there. Barack Obama is the 44th President of the United States of America. When you are the President, the highest form of flattery must be having a Chia Pet created that looks exactly like you. 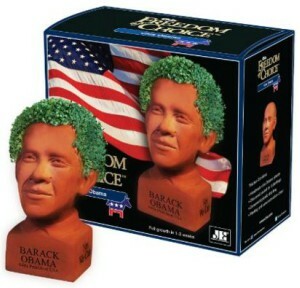 This Chia Pet is Barack Obama’s head on a rectangle block that says “Barack Obama 44th President”and “Yes We Can” written on it. His face is made perfectly and looks exactly like him, well except for the green hair after 1 or 2 weeks. Barack Obama measures approximately 8 inches by 4.5 inches by 7 inches. It is small enough to have on display, but makes for a big impression. It will get the conversations going. Carry around a symbol of strength, peace and a great teacher, so you will be inspired everyday to use a cartoon Dalai Lama spiral notebook. Keep all your things in one place and you too can become a great teacher, or just have your grocery list in the right place at the right time. 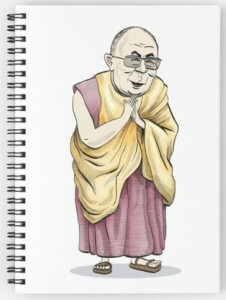 The cover of this spiral notebook has a cartoon portrait of the 14th Dalai Lama. He is wearing a purple and yellow robe, has a smile and is praying for your health and well being. He is such a great human being. This spiral notebook comes with 120 pages and measures approximately 6 inches by 8 inches. You can also choose lined paper to fill your notebook or graph paper, it’s all up to you! Sir Charles Spencer “Charlie” Chaplin will be your new companion in home decor with this amazing Charlie Chaplin Peeking Wall Decal. 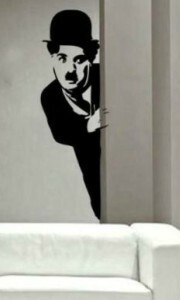 This wall decal is that of Charlie Chaplin as The Tramp. He is wearing his nice suit, with his tie. He has a bowling hat on with some hair coming out of each side under the hat. Don’t forget that signature mustache. Classic Chaplin. He is quietly sneaking and peeking from behind the corner of the wall. This wall decal is simple and quick to install and easy to clean as well. It can be added to any type of flat surface like wallpaper, windows, tiles and walls. It measures approximately 23.5 inches by 72.5 inches, so it is a nice size to make an impression. If you like different theories and are looking for a different and unique t-shirt that has a high IQ. Here is the t-shirt for you. Albert Einstein is one smart cookie. 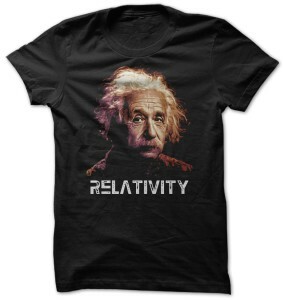 He makes wearing this t-shirt make anyone feel that much smarter. There is a color head shot on the front of this t-shirt. It is a graphic of him with his large bushy mustache and his crazy hair. Under the picture of Einstein is simply the word, “Relativity”. Fantastic. This t-shirt comes in sizes Small to 4XL. This means everyone can enjoy the t-shirt. 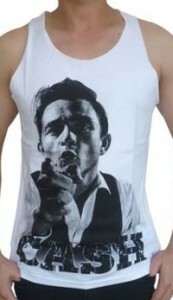 It also comes in ladies sizing as well as mens. It is made of 100% cotton and the sleeves and bottom hem are double stitched for added durability.